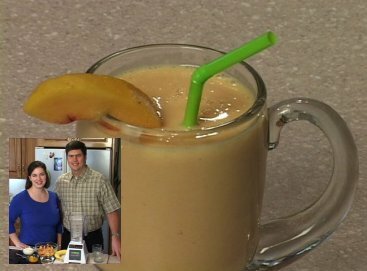 Michelle Locey shows Dan how to make Peach Smoothies. Click here (56k) to watch the video. If you have a high speed connection, click here (300k) to see a higher quality video clip. Place the ingredients in your blender in the order listed (so that the frozen items are on top). Blend to desired consistency. You can substitute the frozen peaches for just about any other frozen fruit.